Infrastructure Monitoring: The Rodney Dangerfield of Performance Management? There’s an unspoken hierarchy in performance management. Application performance management is given the most respect. After all, the end all, be all is the application. The application is the business. Next is network performance management. The poor network is always getting blamed for everything that goes wrong. It’s the scapegoat. Still, it’s better than the infrastructure. Infrastructure monitoring is the Rodney Dangerfield of performance management. It gets no respect. It’s often an afterthought, a third-class citizen, even though, neither the network, nor applications can run without infrastructure—routers, switches, servers, etc. They are the building blocks from which all else stems. If your infrastructure is down, nothing works right! Today’s release of Riverbed® SteelCentral™ NetSensor 3.0 brings the focus back on infrastructure monitoring. NetSensor provides agentless infrastructure component monitoring (both SNMP and WMI polling) and synthetic testing to deliver a comprehensive picture of how infrastructure is affecting network and application performance. NetSensor analytics offer a broad overview of how the devices on the network are performing to complement network and application performance management visibility. This release also focuses on support for SharePoint WMI polling. NetSensor 3.0 can poll more than 70 different WMI metrics from Microsoft SharePoint servers to get detailed information on how the web front-end, application service tier and database tier are performing. 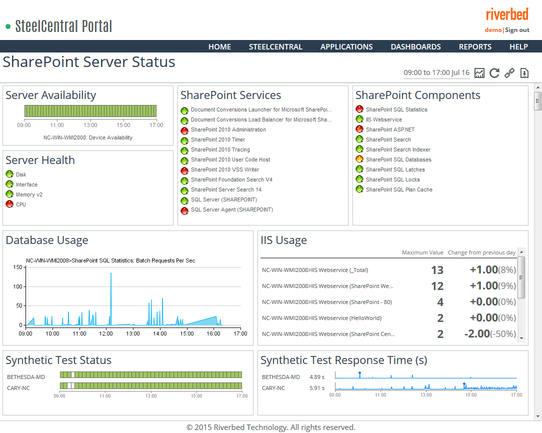 All SharePoint metrics, including the Selenium test results, are displayed in SteelCentral Portal. Figure 1. NetSensor tracks more than 70 SharePoint WMI metrics as well as synthetic test results for availability and responsiveness monitoring and displays them in SteelCentral™ Portal. Which brings me to the SteelCentral Portal integration…NetSensor now uses SteelCentral Portal as its reporting and display engine (previously it used RPM Dashboards). What’s great about using Portal to display NetSensor data is that Portal is your single source of truth for all things performance management—network, application and infrastructure! This means you can show your NetSensor data adjacent to AppInternals data (which also captures some infrastructure details, but because it is agent based its coverage is deeper but often less broad) to instantly see how your infrastructure is affecting application performance. Conversely, you can also display it with AppResponse or NetProfiler data to see if slow performance is the result of a downed router or switch. Figure 2. 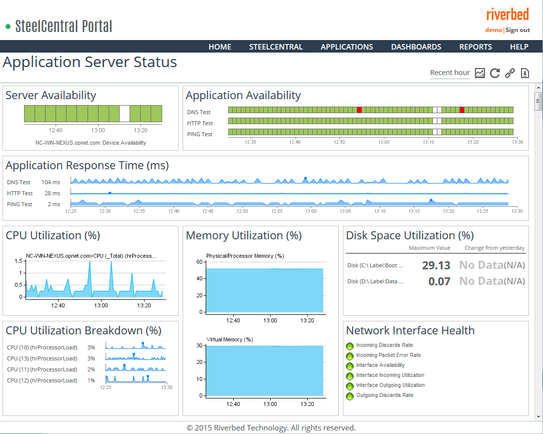 SteelCentral NetSensor monitors server, network device and interface availability and performance indicators, such as bandwidth utilization, packet loss, latency, errors, discards, CPU, and memory for SNMP and WMI-enabled devices and displays these metrics in SteelCentral Portal for integrated network, application and infrastructure performance. So, while infrastructure management may be the Rodney Dangerfield of performance management, NetSensor 3.0 deserves your respect. Check out this SlideShare presentation for more details or contact your account manager to learn more.